Action Comics #242 © 1958 DC Comics. COVER ART BY CURT SWAIN AND STAN KAYE. Whereas the Lex Luthor/Superman rivalry is a clash of brain versus brawn, the Superman/Brainiac war is one of man versus machine. A flying saucer buffered by an impenetrable force field arrives on Earth in “The Super-Duel in Space,” a Superman tale written by Otto Binder and drawn by Al Plastino in Action Comics #242 (1958). Its conceited pilot is a bald, light-greenskinned humanoid, “master of super-scientific forces” Brainiac. With his antennaed spacemonkey Koko by his side, Brainiac uses his Shrinking Ray to miniaturize several major Earth cities, depositing them in enormous bottles until he can restore them to full size on an unspecified world that he controls. Examining his bottled civilizations with tongs (“Help! Giant tweezers ripped the George Washington Bridge loose!” screams one tiny New Yorker), Brainiac is challenged by Superman— whom he derides as “Puny-Man”—stalemating the Man of Steel with his technological wizardry. After the shrinking of Metropolis, Superman, also reduced to a minute scale, ultimately saves the day, returning to normal size himself and all of the cities save one—Kandor, the capital of Krypton, which Brainiac had shrunk prior to the planet's demise. The bottle city of Kandor, later kept in Superman's Fortress of Solitude, long remained a bittersweet element in the Superman mythos: it was the Last Son of Krypton's connection to his native people, but a painful reminder of his failure to return them to a normal life. 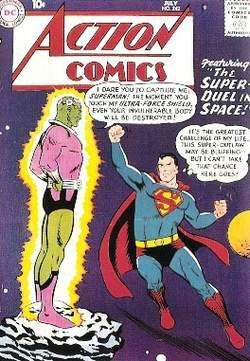 Curiously, the cover of Action #242, illustrated by Curt Swan and Stan Kaye, depicted Brainiac in the form he would soon make famous throughout comics' Silver Age (1956–1969): his pink leotard (with no leggings) and pulsating diodes atop his bald pate; Plastino's interior art, however, depicted the villain in a baggy pink shirt with pink boots and green pants, and with no head-electrodes. Another curiosity is Romado, the Superman comic strip's original version of Brainiac, who briefly appeared in newspapers not long after the villain's Action debut; this bearded, bubble-craniumed space brigand possessed a shrunken and jarred Kryptonian city. After a pair of return engagements, snippets of Brainiac's origin were revealed in Action #276 (1961) in a Supergirl story co-starring the Legion of Super-Heroes and introducing the Legionnaire with the “twelfth-level” intellect, Brainiac 5. “Brainy,” a blond teen with green skin from the planet Colu (alternately Yod in early texts), was reportedly Brainiac's thirtieth-century descendant. In Superman vol. 1 #167 (1964) it was disclosed to readers that Brainiac was an artificial life form, constructed as a spy by the Computer Tyrants of Colu. A lad named Vril Dox was assigned to portray Brainiac's “son” to perpetuate his Coluan guise; Dox, aka Brainiac 2, ultimately spearheaded an uprising against the Computer Tyrants. Superman #167 also officially established the network of electrodes on Brainiac's cranium, which consistently became part of his visual design. For decades Brainiac was one of Superman's most visible foes, thrashing the Man of Tomorrow with an ultra-scientific arsenal. In addition to his Shrinking Ray, which he wielded regularly (even once miniaturizing Superman's friends Lois Lane, Jimmy Olsen, and Perry White as “living trophies”) and his force-field belt, able to withstand Superman's mightiest punches, Brainiac attacked the Metropolis Marvel with a red-green kryptonite ray, a space-time craft, a coma-ray, and a thought-caster. A room in Superman's Fortress of Solitude was devoted to the hero's encounters with Brainiac. The fiendish android often joined forces with criminal scientist Lex Luthor, and once teamed with Clayface II to battle Batman and Superman. Given the importance of Brainiac to the Superman legend, for decades the supervillain's noncomic- book appearances were surprisingly rare. He reduced Metropolis as well as Jimmy and Lois in two 1966 episodes of Filmation's animated The New Adventures of Superman, and he signed up with the Legion of Doom in Challenge of the Super Friends (1978–1979); the latter version was parodied on the Cartoon Network decades later in an animated spot in which Brainiac pleaded with Luthor for “a decent pair of pants.” While Superman was heavily merchandised throughout the 1960s and 1970s, his villains rarely were: a notable exception was Brainiac's inclusion as one of four hand-painted figurines in a 1967 Superman playset from Canadian manufacturer Multiple Toymakers; a Pocket Super Heroes miniature of the Silver Age Brainiac was released in the early 2000s. Writer Marv Wolfman and artist Gil Kane redesigned Brainiac in Action #544 (1983), the title's 45th anniversary edition. The android abandoned his green-pigmented humanoid body for an imposing robotic form, and with it jettisoned any hint of humanity he once might have possessed. Now an annihilative machine, Brainiac campaigned against Superman in a skull-shaped, tentacled spacecraft. He also appeared in mid-1980s Super Powers–related merchandising, including an action figure, before being unplugged by DC Comics' continuity-revising series Crisis on Infinite Earths (1985–1986) and The Man of Steel (1986). In Adventures of Superman #438 (1988) the writer/artist team of John Byrne and Jerry Ordway introduced Brainiac into the reconstructed DC Universe. Extrapolating from elements in the previous continuity, Brainiac was now Colu's “scientist prime” Vril Dox, executed during his attempted coup against his world's Computer Tyrants. Just before his death he transmitted his superior intellect across the cosmos to Earth, possessing the mind of “the Amazing Brainiac,” a carnival mentalist named Milton Fine who possessed latent psychic powers. After using Fine's abilities for mind games against Superman, Brainiac partnered with Lex Luthor, who installed a familiar gridwork of circuitry called a “psi-amplifier” onto Brainiac's shaved head to augment his psionic assaults. In Action #649 (1990) Brainiac was techno-organically enhanced, emerging from a biochemical pool with a powerful physical form and Coluan green skin. As the decade progressed, Brainiac frequently fought Superman, battled the Justice League and the New Gods, and occupied the body of Superman-killer Doomsday. With the new millennium Brainiac downloaded his Coluan intelligence into an android body, becoming Brainiac 2.5. Another attempt at upgrading his form in the 2000 “Superman: Y2K” story arc resulted in an errant future version of the android called Brainiac 13. Brainiac 13 was banished to the dawn of time, but still managed a 2003 appearance as an action figure. In the mid- 2000s Superman, while in the future, skirmished with Brainiac 12, and a digital incarnation of the android infected Barbara Gordon—aka the Oracle, of the Birds of Prey—with Brainiac technology. Brainiac was back in 2005 pushing an angry Superman to the edge of his sanity. With his propensity for upgrades, Brainiac remains a virtually undefeatable Superman foe. An animated version of Brainiac was introduced in the 1996 “Stolen Memories” episode of Superman (1996–2000). Voiced by Corey Burton, Brainiac was originally a computer program on Krypton, surviving the planet's destruction. Traversing the galaxy on a mission emphasizing data collection over sentient life, this blue-skinned Brainiac fought Superman in several episodes and was absorbed into the rogues' gallery of the Cartoon Network's Justice League (2001–2004) and Justice League Unlimited (2004–present). Brainiac action figures from both series were produced. Kevin Spacey was considered for the role of Brainiac in the late 1990s in the Tim Burton– helmed movie Superman Lives, which was aborted after spiraling pre-production costs and frequent false starts (Sean Connery was rumored to be under consideration for the Brainiac role in an earlier incarnation of the film). Spacey was destined to play a Superman foe, however—Luthor, in Brian Singer's 2006 Superman Returns. Brainiac at last made the leap onto the live-action screen in the 2005 season of the WB's Smallville (2001–present) when James Masters, a fan favorite from his portrayal of Spike on Buffy the Vampire Slayer (1997–2003), was introduced as Brainiac, first seen oozing out of a Kryptonian villains' spaceship that had landed on Earth. Brainiac has assimilated into society as Milton Fine, Clark Kent's college professor, who attempts to persuade the pre- Superman to use his powers against the common good. Romeo Mendoza is the president of Brainiacs from Mars and said he developed the idea while driving his daughter home from school in Anaheim, Calif. WHILE Hammond has left behind Brainiac to concentrate on Top Gear, his colleague James May is constantly spreading his wings. Team Brainiacs, which solved five problems, had as its members Baljit Singh, Fahim Imaduddin Dalvi and Syed Ali Hashim Moosavi. Jackson started work fairly early in life; he had a bit of a savings jump-start, yet assuming early earnings were invested on flashy trousers, the subsequent 30 years of work would have been placed in jeopardy by adherence to a passive investment strategy aligned to the Brainiacs of 1980. Teacher Miss Rowan was delighted with the efforts of all five teams but in the end, in her self-appointed role as "Chairperson of the World," she decided her prizewinning rowan tree should be officially planted in the school grounds by the Brainiacs. He says: "Gathered around me are the biggest bunch of eggheads and brainiacs taxis could be sent out to collect. To the outsider, it appears sleepy and bucolic but is, in fact, populated with eccentric brainiacs working for the government, developing all manner of gizmos, many of which result in inadvertent if routine explosions around town. Like the mythic Canadian Mountie, the CSI brainiacs always get their man--because in the world of fingerprint and DNA analysis there is no room for interpretation, ambiguity, or error. As always, this mix of old friends and fresh new brainiacs inspires, educates, and entertains. M Wadi Kabir Aces Muqeet Fouzan Baig & Tay R Doshi A and V Vishl Udandarad & Anand Asokan Brainiacs Aminsh Moharir & Jerry Anthony ISWK Brainiacs Shanel Scaria George & Jevita Saldanha Toxicans B S.
In the Big Bang Theory, back tonight for series two, our heroes, Sheldon and Leonard, are young physics brainiacs who could probably give Stephen Hawking a run for his money.